Home › Style › Marble – A Costly Investment in your Home? Last week we visited the Spanish town of Markina, home to one of the most beautiful marbles in the world. And who wouldn’t want to adorn their home with this sleek, elegant and 100% natural material. For millennia it has embellished the palatial residences of royalty, and been employed by the Masters for some of the greatest sculptures, such as Donatello’s David below. 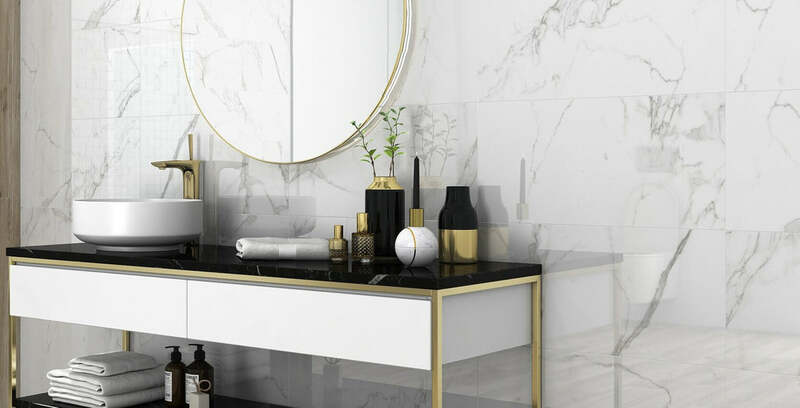 Indeed, in recent times marble has moved out of the palaces and into our homes - particularly into kitchens and bathrooms - helping to lend a luxurious look to our dwellings. However on our trip to Spain last week we discovered a couple of significant drawbacks to using marble in the home. So wide is the range of such drawbacks related to the use of marble in the home, that I thought it'd be useful to summarise them in this week’s article. You pay for luxury, and marble can be prohibitively expensive. It’s certainly one of the most expensive flooring materials on the market. And in addition, you’ll need to fork out extra bundles of money to employ a true stone professional, not only to install it, but also to refinish it annually to keep it looking its best. Allied to the cost is the fact that there's only a finite amount of marble in the world, and it’s becoming ever more challenging to source quality marble for homes. Perhaps Jon Bon Jovi had marble flooring in mind when he wrote his third album. Polished or cleaned marble flooring - even in a dry state - presents a genuine slipping hazard to anyone walking over it. For those of us who swotted hard at physics in school, we’ll know it’s down to the low coefficient of friction of polished marble. When marble flooring is wet the risk is further compounded, and poses a serious health risk. Hence using marble flooring in bathrooms, kitchens, or anywhere there is likely to be a spill should be an absolute no-no. You could mitigate the danger by using floor mats – but why would you buy expensive marble flooring only to cover it up? Could you Dye in a Marble Shower? With Halloween on the horizon, many may be contemplating dying their hair so as to fit in with the other spooks and ghouls in the neighbourhood. If you have a marble shower, don’t consider it for a second. Marble, being a soft stone, is extremely absorbent. And if you dye your hair in a marble shower, the stone is likely to absorb the dye and cause permanent staining and discolouration. If physics wasn’t your thing in school, maybe chemistry was. And as any chemist knows, a base material such as marble reacts whenever it interacts with an acid. Such chemical reactions result in etching and permanent staining of the marble surface. And we’re not talking about some exotic acid from the chemistry lab. Countless everyday household cleaning products are acid based, and thus the simple act of cleaning your marble countertop or flooring can result in rather noticeable staining. Similarly in the bathroom – many lotions, shower products, and bathing products are acidic and place that gorgeous marble shower tile in danger of permanent staining. In fact many of the foods we consume - such as wine, beer, soft drinks, sauces, fruit, and juices - are acidic. So the marble countertop or floor is in constant jeopardy due to splash or spillage in the kitchen. Remember what Frankie said back in the 80s? However, marble is such a porous stone that it can be very difficult for its owners to relax. So soft and porous is it that spillages of any type require immediate attention to reduce the risk of stains and discolouration. Owners of marble-bedecked kitchens are known to end up running around like Mrs. Doubtfire, grabbing at wine glasses as soon as they’re set down on the countertops. “That will leave another ring! !” she says, mopping up spills as soon as they occur so that surfaces remain unadulterated and stain-free. And who wants to live in a world where we can’t recline after a hard day and enjoy some fava beans, a nice chianti, and a bit of splish splosh splash? A polished marble tile is quite easily scratched – and the repetitive movement of furniture such as chairs can create gashes on its surface. Even the clicking of heels can scratch a marble floor. Repairing such scratches is a complicated procedure and requires the expense of a professional. It should be evident by this stage that marble demands a high degree of maintenance and requires constant care for its brilliance to be accentuated. It has to be dusted and mopped extensively, otherwise it will appear dirty. Marble countertops need to be respected by using trivets, potholders, and cutting boards to prevent scratches or chips. Furniture needs to be lifted - not slid - across marble floors, and heels must be removed before you march in on them. In fact, in order to prevent the staining and etching referred to above, many owners opt to protect their marble with a surface barrier sealing chemical. The sealing creates a transparent film over the marble which prevents liquids from penetrating the stone, and offers protection against acidic and other staining agents. However, to ensure adequate protection and maintain tile appearance, the sealant needs to be reapplied every six to twelve months. Although you might be delighted with your expensive marble flooring today. The time may come in the future when your wish to replace it. This is often the moment when people discover just how difficult it is to remove marble flooring. Marble flooring is so resistant to being moved on, that many home owners find that it's easier to just leave it there and install the new floor directly over the marble. So there you have it - a pretty comprehensive list of the drawbacks of marble flooring. So does that mean we have to forego that luxurious, opulent look for our home? Could some genius not develop a material that retains the opulence, yet somehow mitigates the shortcomings? Well, I’m delighted to reveal that such a material has been developed, and is brought to you by Tile Devil. Tile Devil’s marble effect tiles preserve the sophisticated lustrous appearance of marble, while eliminating almost all of its shortcomings. Pictured below is the beautiful Crema Marfil marble effect floor tile in a regal setting. In next week’s article I’ll explain exactly what marble effect tiles are, and how they succeed in neutralising the drawbacks of marble stone.